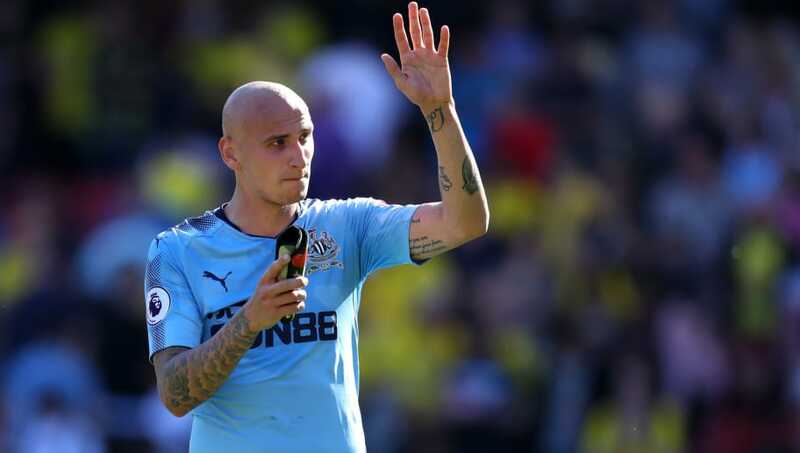 ​Jonjo Shelvey was left 'upset' by England boss Gareth Southgate following the midfielder's omission from the Three Lions' squad ahead of the World Cup in Russia this summer, according to ​Newcastle United team-mate Dwight Gayle. The 26-year-old, who has received backing from a number of high-profile names, was left out by the 47-year-old national team manager, with Jordan Henderson, Jesse Lingard, Ruben Loftus-Cheek, as well as Dele Alli and Eric Dier all preferred instead. Fabian Delph was another to make the list, although his versatility - which has been shown under Pep Guardiola at ​Manchester City this term - could be an explanation as to why the 28-year-old was chosen. "If Jonjo Shelvey gets his head down and plays six months of good football, he's exactly what England need"
Shelvey plays six months of good football. However, Shelvey also failed to make England's standby list, with Lewis Cook, Adam Lallana and Jake Livermore Southgate's preferred options, something which, according to Gayle, has left the Romford-born midfielder 'upset'. “I am close friends with Jonjo, and he was upset he didn’t make it,” Gayle said of his team-mate's omission during an interview with the Mirror. “His range of passes, one touches, and thought process are a lot quicker than other players. And while he is not the biggest guy, you don’t often see him getting pushed off the ball, because he is so forward-thinking in possession. I cant wait for Southgate to leave England, he told Wilshere to play consistently in PL to be considered for the WC, he does that and he still don’t pick him, he then doesn’t pick Shelvey over concerns about his discipline, but he takes Livermore who stole a taxi and took drugs! During his post-announcement press conference, Southgate cited, 'personality' as the reasoning behind Shelvey not making the plane; however, Gayle is adamant the 26-year-old is simply misunderstood. “He’s perceived to be a bit differently,” the Toon Army frontman added. “But he’s a good lad and a really good friend. It’s his will to win that might make people see him as aggressive. Last weekend, we were in the garden with the lads, and some of their kids are having a kick-about. Then Jonjo joined in and started flying into them with full-on tackles! Despite Alan Shearer, Chris Waddle and Ian Wright all recently claiming Shelvey should be included in the squad, one goal and three assists in 30 league appearances may also go some way in the reasoning behind Southgate's decision.